This study examined the use of educational technology in the classroom as a tool for equity. This research utilized a quasi-experimental study including a control group and treatment group which were both administered a pretest and posttest. Throughout the study, one group of students had access to technology and daily use of a specific website, while the other group did not have that same access. This study aimed to determine whether the inclusion of specific technological resources would have an effect on student outcomes. Research analysis showed that the use of educational technology had little to no impact on student outcomes. The driving question from my original research paper has evolved quite a bit since its original inception. 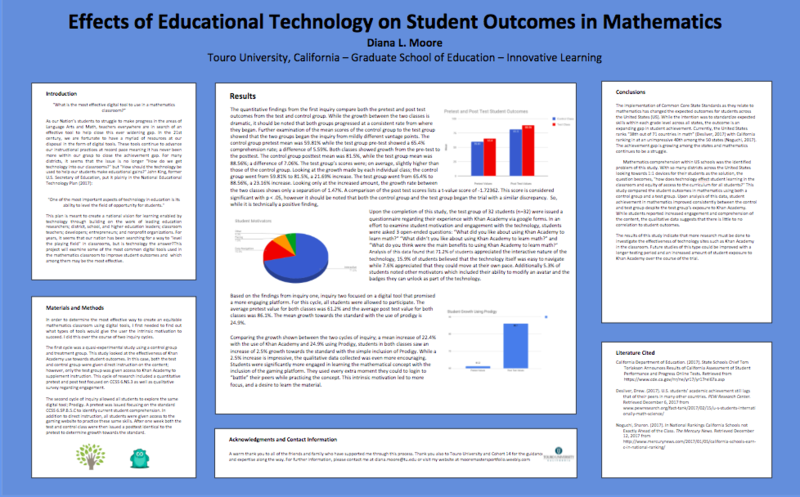 When I began this journey, my question asked "What are the Effects of Educational Technology on Student Outcomes in Mathematics?" However, as the program continued, I found that I needed to be more specific with what type of technology I was choosing to use with my students. The reality is, that the qualitative data collected showed that my students were not motivated while using certain websites. Student needs played a much larger role as I was collecting data for my second inquiry. This resulted in a second inquiry which asked "What are the Most Effective Digital Tools to Increase Student Outcomes in Mathematics?" Sociocultural: Sixth grade students look primarily to their peers for acceptance. They have a strong desire to “fit in” and enjoy what those around them are working on. They fear sticking out or seeming “different” in any way. Technical: Social media and smart phones are their primary source of comminication. They belong to applications such as musical.ly, snapchat and twitter. They text and facetime. They are exceptional computer and chromebook users and have the ability to manipulate these devices with ease. Informational: They use YouTube, Google and have been introduced to Google Drive and many of its resources. They have used flipgrid but due to their delicate sense of self at this age they struggle with the idea of being on camera. Educational: Sixth grade is a time when students transition from primary to secondary education. Sixth graders are expected to enter seventh grade with a solid foundation of all mathematical concepts. These concepts will them be explored in more depth as they matriculate. Previous research into this topic has been decidedly inconclusive. Some articles show that there may be strong correlation between technology use leading to positive student outcomes, while others indicate that this type of intervention has little to no effect. The use of technology in the classroom has been widely researched and often proven successful to keep students engaged and motivated. Based on research (Bruhn et al., 2016; Donald, 2016; Linskens, 2013), it seems that the use of technology in the classroom has proven successful to keep students engaged and motivated. This motivation however, and the actual amount of learning that takes place is highly dependent on teacher choice of technology and applications. Dunmire (2010) makes it clear that the individual choices made should be strategic and purposeful in order to have a positive impact. In lower income schools or with “at risk” students, this choice can have an even larger impact. The articles: “Integrating Ipads for Math Intervention,” (Linskens, 2013), “At-Risk Students and Technology Education: A Qualitative Study” (Cardon, 2004) and “Increasing Student Engagement in Math: The use of Khan Academy in Chilean Classrooms” researchers began with a similar concept. While each of these articles set out determine the most effective applications to support mathematical learning, researchers also noted that students already deemed “at risk” have more at stake in education. So, the question becomes, will Khan Academy have a positive effect on at risk students? Looking more closely at Khan Academy, researchers have found both a positive and negative correlation to both qualitative and quantitative data. 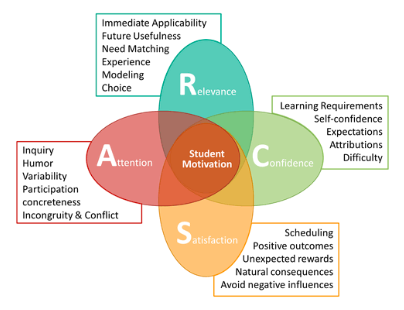 In “21st Century Rewards: A Case Study of Khan Academy and Digital Badges from an Educational Psychology Perspective.” (Zellner, 2015) and “Khan Academy as Supplemental Instruction” (Kelly & Rutherford, 2017) both researchers found; using numerical test data, student interviews and questionnaires that not only did student engagement and test scores go up, but because Khan Academy uses a series of badges to reward for practice, student motivation increased as well. Not all research has had a positive outcome. In the study “Increasing Student Performance by Incorporating Artificial Intelligence into Video-based Instruction: A Comparison of A-list Empire’s Educational Software to Khan Academy’s.” (Leddo, et al., 2017) Using a test group and a control group, Khan Academy was compared to A-list Empire which includes a type of Artificial Intelligence (AI). As a result, students using A-list Empire’s software showed higher performance for difficult topics than those using Khan Academy’s software. The study “Online Video Learning: The Effect of Self Explanation,” (Devers, Devers, Alayan, & Reaves, 2013) compared students who watched a video to learn versus students who used the method of self explanation. Results revealed that the creation of a self-explanation video did not significantly improve post-test scores over the control group, but both groups benefited from watching the video. With no significant growth it seemed as though Khan Academy; though a beneficial tool, was not engaging enough for my students. After reviewing the qualitative data collected during the inquiry, my students wanted more. They wanted: to be entertained and to not feel as though they were learning. Thats when I discovered Prodigy!